Traditionally, Sunday travel sections in daily newspapers, at least in the United States, are stunningly Eurocentric. I have no statistics to support my contention, but I would estimate that upwards of 75 percent of all foreign destination coverage is European, with another 15 percent devoted to Asia and the remainder to the Americas and Africa. Coverage of the Americas is most often Mexico and the Caribbean, while that of South America and especially the Southern Cone countries is almost nil. 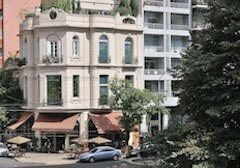 (a brief hotel review and a longer piece on the city), and Montevideo (the section’s weekly feature “36 Hours”). 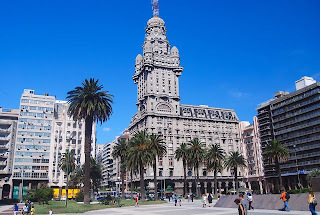 Buenos Aires, along with perhaps Rio de Janeiro, is probably the South American city that most frequently appears in the Times, but Santiago and Montevideo are relative novelties. The Santiago article, more than half a page long, bore the headline “Chile’s Capital Awakens From Its Eternal Sleep” - quoting Nobel Prize poet Pablo Neruda as to the city’s seeming somnolence - and describes it as an “electrifying place of vibrant contrasts, with lush new parks, renovated Beaux-Arts neighborhoods, and blocks of glamazon-thronged galleries and cafes clustered around ‘Sanhattan,’ the soaring financial district.” As Chile’s 2010 bicentennial approaches, the article implies, Santiago is an underrated destination worthy of a visit in its own right, rather than merely a transfer point to the Atacama desert or Patagonia. 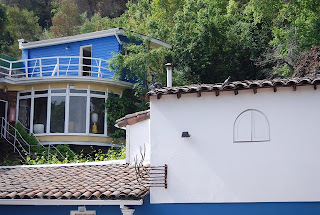 Attractions such as Neruda’s La Chascona home (pictured above) and the Museo de Arte Precolombino merit lengthy explorations, and it’s even possible to arrange bicycle tours through La Bicicleta Verde (English spoken). Although the author barely mentions it, the city has a thriving restaurant scene, especially but not exclusively in the Bellavista neighborhood. Meanwhile, the Times devotes nearly an entire page to Montevideo, an almost equally underrated city in the shadow of Buenos Aires (just as Uruguay lies in the shadow of Argentina). There are excellent choices for sightseeing such as the Museo Gurvich, displaying the work of one of Uruguay’s top 20th-century artists (it’s worth noting that Uruguayan banknotes feature artists and writers rather than pompous generals on horseback) and the Palacio Salvo (pictured above), and for lunch at the classically carnivorous Mercado del Puerto (pictured below), which is a sight in itself. In addition, it suggests taking in tango (Uruguayans love it as much as Argentines) or candombe at Baar Fun Fun, an informal bar and night club. For those continuing to Uruguay’s No. 1 destination, though, there may be some glitches this summer. According to the Buenos Aires daily Clarín, hotels in the beach resort of Punta del Este are embroiled in a bitter dispute with credit card companies and are not accepting American Express, Diners Club, MasterCard or Visa. Given hotel prices in January and February, Argentines and others planning to summer in Punta could have to carry lots of cash. 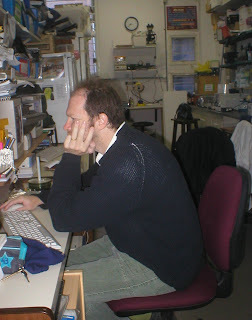 When I wrote Tuesday's blog entry on jet lag, I was unaware that, in 2007, Argentine biologist Diego Golombek (pictured here), of the Universidad Nacional de Quilmes, had received an Ig Nobel Prize in Aviation for his discovery that Viagra aids jetlag recovery in hamsters. According to a summary of Golombek's research in a transcript of a Scientific American podcast, the hamsters suffered from grogginess and disorientation after Golombek and his assistants "booked them on the red eye from Buenos Aires to Bucharest - or the laboratory equivalent of turning on the lights six hours early." When that happened, "it took a while to figure out when to start running in their exercise wheels, which they usually do after dark. What the researchers found is that hamsters that were given Viagra the night before the time change recovered faster than hamsters that do it without the drug. Whether similar treatment would provide relief to weary world travelers is an experiment that's probably been inadvertently done, but not reported." Perhaps Governor Mark Sanford of South Carolina has some experience with this. One of the greatest misconceptions about South America, and specifically the Southern Cone countries, is that it is remote, but this is relative. The distances to Buenos Aires and Santiago are great but, in more than one sense, they are much closer to North America in terms of time. Most North Americans think little of hopping on a plane to London, which is five time zones east of New York and eight time zones from California, but this normally means jet lag that costs them at least a day on arrival in Europe. Crossing the Pacific to Asia involves even greater distances and, if you’re unable to sleep, the time change can be truly torturous. The South American continent, by contrast, is only slightly east of North America, and for most of the year, the hour in Santiago exactly the same as New York City, while Buenos Aires is an hour ahead. Visitors to the Southern Cone, then, are likely to arrive far less jet-lagged than visitors to Europe or Asia. The difference is even greater when you realize that most flights from North America to the Southern Cone capitals are night flights that arrive first thing in the morning. If you’re able to sleep aboard a plane - it helps, of course, to go by clase ejecutiva (business class) or primera clase (first class), you’re likely to arrive refreshed, without losing a day. This changes slightly in the approaching Southern Hemisphere summer, however. On October 10, Chile advanced the clock for daylight savings, and it’s now an hour ahead of New York - exactly the same as the difference between Chicago and New York. LAN flight No. 533 from New York, for instance, presently leaves at 8 p.m. and arrives at 7:50 a.m. Chilean time, an elapsed time of 10 hours and 50 minutes. Chile will observe daylight savings time until March 13. When daylight savings ends in the United States at the end of this month, however, the difference will be two hours, still a relatively minor difference if jet lag is an issue. However, for travelers from, say, Los Angeles, the difference is five hours. Despite Chile’s latitudinal extent, from the subtropics along the Peruvian border to the sub-Antarctic in Tierra del Fuego, virtually the entire country comprises a single time zone. This causes some oddities - in the northernmost city of Arica, where daytime and nighttime are roughly equal throughout the year, it’s not fully light until after 8 a.m. In Punta Arenas, by contrast, midsummer daylight can start around 5 a.m. and last until 11 p.m. Easter Island, five hours west by jet, is two hours behind the mainland. In Argentina, oddly, daylight savings has become a big political issue because many of the provinces, which depend on agriculture and tourism, resent being dictated to by Buenos Aires in the name of energy conservation; the western province of San Luis has resisted for years. The tourism industry likes an earlier sunset because it gets visitors to restaurants and bars earlier and, it seems, they’ve won this year’s argument. 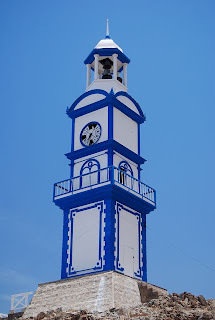 For foreign visitors this southern summer, this conveniently means that Chile and Argentina will be on the same schedule - but the historic clock tower in the Chilean town of Pisagua (pictured above) is unlikely to help, as it hasn't functioned for decades. Still, in most Chilean cities, the fire station sounds a noontime klaxon to let the citizens know the day is advancing. Earlier this month, two significant events took place in the Southern Cone musical scene. On the one hand, Argentine folksinger Mercedes Sosa, who gave outspoken performances in public even after the military coup of 1976 before being forced into exile, died at the age of 74. Sosa, perhaps the most beloved performer in all of Argentina, was honored by a three-day official mourning period, with her ashes to be scattered among her northwestern birthplace of Tucumán, the western city of Mendoza, and the city of Buenos Aires. Sosa won three Latin Grammy awards in the last decade, but was no purist, performing with artists such as Argentine rock icon Charly García and Colombian pop singer Shakira. 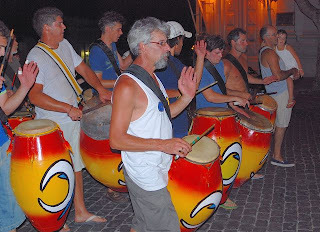 On a more positive note, the United Nations Educational, Scientific and Cultural Organization (UNESCO) declared Uruguayan candombe, a music and dance that derives from Afro-Uruguayan tradition, as part of the world's Intangible Cultural Heritage of Humanity. Mostly concentrated in Montevideo’s Barrio Sur, the Afro-Uruguayan population is only about 5.5 percent of the country’s 3.6 million people, but candombe, with its rhythmic drumming on barrel-shaped tamboriles is not exclusive to Afro-Uruguayans, as the accompanying photograph, taken in the World Heritage Site of Colonia, would suggest. It is most commonly seen in January or February, during Carnaval festivities, which are not so exuberant as in Brazil, but considerably more so than in Argentina. Moon Handbooks Chile: We Have Two Winners! By the time I arose and read by email this morning, my inbox already two correct answers to yesterday’s quiz, provided by Tyfannie Ammeter of Santiago (who has her own blog La Chilenguita) and Christian Mondorf (whose email address comes from Denmark but whose name sounds German to me). Both will be receiving a copy of the new third edition of Moon Handbooks Chile as soon as I can realistically get them in the mail. 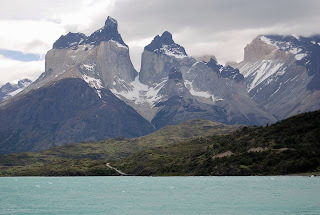 For those of you who hadn’t figured out the answers: 1) The photograph destination is Chilean Patagonia's Parque Nacional Torres del Paine (including the Cuernos del Paine or Horns of Paine, pictured here from a different perspective); 2) the animal in question is a guanaco, a wild relative of the domestic llama and alpaca that is abundant in the park, and now tame enough to be easily photographed. 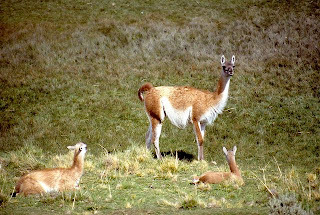 It’s one of the big successes of Chilean conservation. I’m due to return to Chile at the end of the month, when I will pick up my car and head across the border to prepare the new edition of Moon Handbooks Argentina. 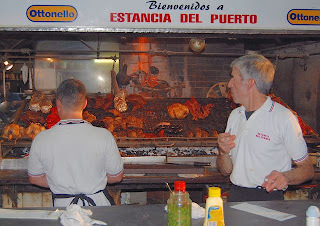 In the interim, I will continue to post about topics in travel to the Southern Cone countries, and may even have another quiz (with a slightly more difficult question). Moon Handbooks Chile: Win the New Third Edition! Friday afternoon the UPS delivery brought two large boxes that, as I anticipated, included my contractually stipulated 50 copies of the new third edition of Moon Handbooks Chile. Just in time for the upcoming southern hemisphere travel season, it’s fully updated, particularly with respect to the Chilean wine country, the latest in hotels and restaurants, and even the ins-and-outs of visiting volcano-ravaged Chaitén. 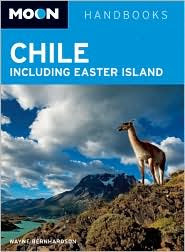 The book also covers southernmost Argentine Patagonia, including Tierra del Fuego, and Chile's Pacific possessions of Easter Island (Rapa Nui) and the Juan Fernández archipelago. In recognition of the new edition, I’m opening a contest that, I hope and expect, will soon have TWO winners. That’s because I’m giving away free copies of the book to the first two correct answers to following quiz, which I think is a fairly easy two-part question: 1) What is the destination depicted on the cover of the new edition? ; 2) what is the common name of the animal appears within the photograph?